My index gets spottier toward the end of the decade. Still better than the early 1930s, which will run here soon after we take a week off for regular Stripper's Guide posts. 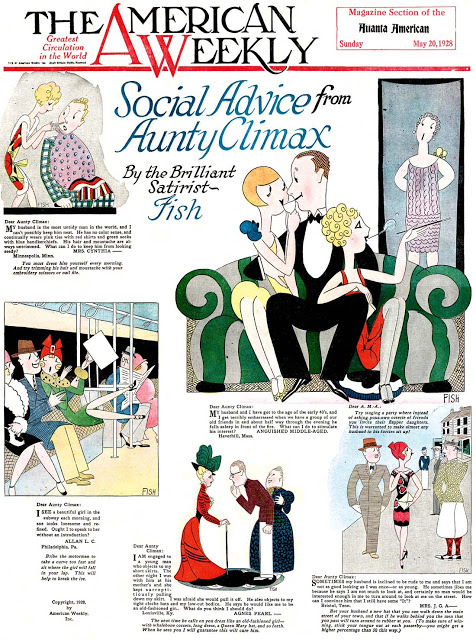 In this period, Henry Clive becomes a major contributor of pin-up covers and the fabulous Britisher Fish arrives. This period also sees a trend toward occasional wacky pseudo-science covers. This period was the heyday for Nell Brinkley and G.E. Studdy, both of whom would tail off considerably after these years. * when you see a "#", that means that the cover is part of a numbered series and the number is given on the cover. Sometimes I remembered to write that down, sometimes I didn't so its catch-as-catch-can. If a series cover explicitly states that it is the first or final installment and its not obvious from the surrounding dates, I sometimes note that as "(start)" or "(end)".